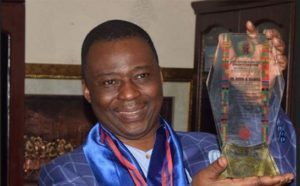 The General overseer of Mountain of Fire and Miracles Ministries Worldwide, also known as MFM, Daniel Kolawole Olukoya has lost his mother, Janet to the cold arms of death. The news was confirmed by the chairman, MFM media committee, Oladele Bank-Olemoh, in a statement issued on Monday. Bank-Olemoh’s statement revealed that Janet Olukoya, who died at age 95, passed on in the early hours of March 31 while asleep. The statement read in parts, “Mama was a fervent worshipper at the MFM International Headquarters, Onike-Yaba, Lagos, where she was a prayer warrior and a member of the Elders Group. Her death is coming 25 years after the loss of her husband. Janet is survived by the MFM founder and Funmilayo Olowoake, who is also a member of MFM, her grandchildren and many other family members. Daniel Olukoya is a molecular geneticist, Pentecostal minister, amongst others, born in Ondo to a police officer and his mother, a trader. Information credited to Mountainoffire reports that he registered at Saint John’s CAC Primary School, Akure for his primary education and was recognized as an intelligent child coming tops throughout his stay in the school. With his family moving to Lagos, he enrolled at Saint Jude’s Primary school, Ebute metta and afterwards, attended Methodist Boys’ High School, Lagos. In 1976, he moved to the University of Lagos (Unilag) where he gained admission and graduated in 1980 with a degree in microbiology. He later proceeded on scholarship to the University of Reading, Reading, Berkshire, England for his Doctorate degree in molecular genetics and returned to Nigeria where he worked as a geneticist at the Nigerian Institute of Medical Research (NIMR), Yaba, publishing over 70 scientific papers. Other achievements include the establishment of Daniel & Fola Biotechnology Foundation, a registered NGO which trains Nigerian citizens in molecular biology and biotechnology. He established Mountain of Fire and Miracles in 1989 and is happily married to Shade Olukoya with a son named Elijah Toluwani. This entry was posted in Christianity, News and tagged Akure, Daniel Kolawole Olukoya, MFM, Mountain of Fire and Miracles Ministries Worldwide, Oladele Bank-Olemoh, Saint John’s CAC Primary School. Bookmark the permalink.